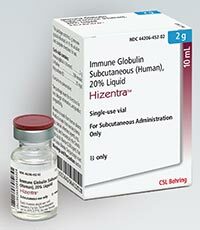 CSL Behring announced that the FDA has expanded the administration options for Hizentra (immune serum globulin [human]) 0.2mg/mL (20%) liquid for SC injection to include dosing once every 2 weeks in addition to weekly dosing for patients with primary immunodeficiency. The FDA approved the bi-weekly dosing for Hizentra based on the principles of pharmacometrics and pharmacokinetic modeling. The new dosing option allows greater flexibility by allowing patients to self-administer less frequently. Hizentra delivers consistent levels of immunoglobulin G (IgG) replacement therapy to help protect those with PI against infections. Hizentra received FDA approval in March 2010 as a once-weekly immunoglobulin G (IgG) replacement therapy. For more information call (800) 504-5434 or visit Hizentra.com.